Successfully Added Protective Case + Power Pack For iPhone6 - 3200mAh Power Bank, 4LED Indication Lights, to your Shopping Cart. This 3200mAh power bank and protective case for the 4.7 inch iPhone 6 is the perfect accessory to let you enjoy your iPhone for longer. The 4.7 inch iPhone 6 comes with a built in battery that has a reasonable life span however due to Apples thin case design the battery isn’t removable, this substantial drawback means that unlike other phones when the battery in your iPhone 6 runs out you can’t just pop open the case and put in a spare. You have to charge the battery! This can be a real pain especially when there’s no power socket nearby. Well thankfully you can now you can easily work around this dilemma by getting this wonderful iPhone 6 power pack and protective case. Most standard power packs are bulky and look anything but elegant, not this one. 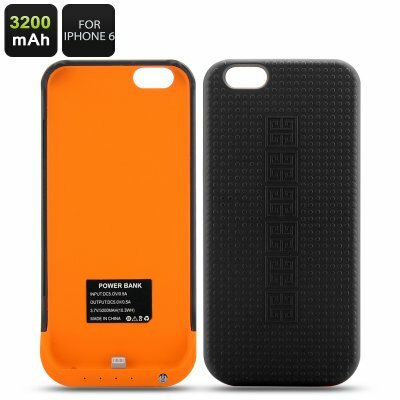 Designed specifically for your 4.7 Inch iPhone 6 this power pack and protective case maintains that stylish sleek Apple styling and offers a huge 3200mAh power pack that can substantially increase the life of your iPhone between charges. There are 4 LED indication lights to display the remaining power in 25% intervals. As the 4.7 inch iphone 6 battery has a capacity of around 1800mAh a boost of 3200mAh is a real plus and should really let you get the most from your device for days on end. More than just a power bank this handy accessory is also a protective case helping prevent damage from knocks and bumps as well as adding an extra layer of protection to counter the dreaded warping iPhone syndrome, so it's a lot less likely to bend when in your trouser pocket. This product is in stock now, we guarantee next working day shipping and offer a 12 months warranty on all our products. Brought to you by the leader in electronic devices and wholesale phones and accessories, Chinavasion. "Apple" and "iPhone 6" are trademarks of Apple Inc., registered in the U.S. and other countries. This is not claimed to be an authorized or branded product by Apple Inc. The product and our company are not affiliated with Apple Inc. or endorsed by them in any way.